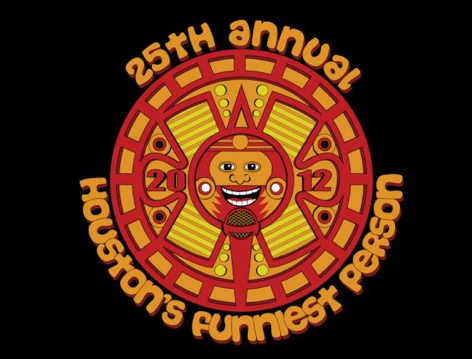 The Houston’s Funniest Person contest was held in May and June of 2011 at The Laff Spot Comedy Club. The winner that year was Theodore Taylor. Shortly thereafter, The Laff Spot closed on July 3, 2011. What was to become of the HFP contest? Nobody would know until March of 2012. It was then that the Houston Comedy Union and John Wessling would take control of the event. There were still a lot of questions to be answered. Who could enter? When would it start? How long would it last? And most importantly, where would it take place? On March 6th, all of those questions were answered. The contest was open to anyone in the greater Houston area that had not previously won the contest. Initially the contest was slated to have 45 contestants and three rounds, but the demand grew. So a fourth round was added, making it a total of 60 people competing in the 2012 HFP. The top three people from each of the preliminary rounds would automatically advance to the semi-finals. The fourth and fifth place finishers from each preliminary round would be eligible to get into the wild-card round. Only the top six wild-cards scores would be advancing. The contest was going to held at three different venues; The House of Blues, The Comedy Showcase and Sherlock’s Pub in River Oaks. From the moment the rules were announced, it seemed like an eternity until the competition actually started. Everyone from pros to first timers entered the contest. There were a lot of expectations. Expectations from each comic hoping they do well. Expectations from fans of comedy hoping that it would be an entertaining contest. And the highest expectations coming from John Wessling, hoping that the contest would be a success. The opening night of the contest was held in the Crossroads Cafe at The House of Blues on Thursday, May 24th. There was an open mic on Thursdays previous to the contest, so they were familiar with comedy in that room. The performance order was announced and the anticipation was growing. The first person to tell a joke in the 25th Annual Houston’s Funniest Person contest was Joe Bates. The contest had begun. Fifteen people battling it out on the first night, trying to get an automatic birth into the semi-final round. Two hours later, all the comics had performed and the results were in. Coming in first place, on the first night of the preliminary round, was Ken Boyd. Stephen Cook came in second place and G.W. Boles in third place. The wild-card qualifiers were Joe Bates and Dianne Gallagher. The first night was in the books and the contest was under way. Sherlock’s Pub in River Oaks was the location of the second night of the preliminary round. That night, May 27th, was the original opening night of the contest. Sherlock’s Pub was home to the Houston Comedy Union, the place where the biggest open mic in Houston was held every Monday. Comedy was welcome and expected there! And so, the next night of the contest had begun. Each comic knew the order in which they were to perform that night. Everyone was giving it their best, trying to avoid the wild-card round. After the results were calculated, the top five finishers that night were called in order. First place, Slade Ham. Second place, Owen Dunn. Third place, Will Seagrim. Wild-card qualifiers were Ryder Paramore and Coleman Cox. The third night of the prelims took place at the Comedy Showcase. Anticipation grew as the night went on. The contestants went in the order they were drawn. The results were in. Mickey Housley, Kristin Lindner, and Matthew Broussard took the top three spots, respectively. Judd Jones and Justin Thompson captured the two wild-card spots. The last night of the prelims was to take place at Sherlock’s Pub. On the morning of June 3rd, everyone found out that Sherlock’s had closed its door for good. John Wessling scrambled to secure another spot for the contest. Baker St. Pub became the new location. Nobody knew what to expect. The order in which to perform was given to the contestants. People started showing up and it became a standing room only audience. Each comic gave it there best and waited on the results. Barrett Goldsmith came in 1st, Mark Hurtado in 2nd and Ryan Thauburn in 3rd. Zac Brooks and Gerald Torregosa were the wild-cards. The preliminary round had come to an end. The wild-card round was set to take place at Sherlock’s on June 4th, and with such short notice it couldn’t be done at Baker St. Pub. It was moved to Fitzgeralds, another local open mic venue, that Wednesday. Brooks and Torregosa had the lowest scores of the wild-card qualifiers and were automatically eliminated. This round was comic competing against comic. Jones vs. Thompson, Paramore vs. Gallagher and Cox vs. Bates. After the head to head match-up, the crowd decided who advanced. Going to the semi-finals were Thompson, Gallagher and Bates. The Comedy Showcase is where the contestants were going to compete in the first night of the semi-final round. The results of the first night were in. The 2nd night of the semi-final round was held at Baker St. Pub. The results of night two combined with night one would be added together and only the top 7 would secure a spot in the finals. Ham, Lindner, Thauburn, Boyd, Housley, Dunn and Broussard advanced. The 8th and 9th place finishers, Goldsmith and Thompson, would compete for the last spot in the finals at Fitzgeralds open mic that next Wednesday. Goldsmith took the last spot. The finals were a three night event. First night at The Comedy Showcase, second night at Baker St Pub and the finale at the place where the contest began, The House of Blues. Ten minutes were given to each comic this round. The top 2 scores from each of the comics from all 3 nights would decide the winner of the contest. The top 3 finishers of night one were Goldsmith, Broussard and Ham. The top 3 finishers of night two were Broussard, Goldsmith, with Ham and Dunn tying for third. The scene was set. It was a standing room only audience at the House of Blues. Each comic still competing, telling their best jokes. After the results of the first two nights, mathematically it came down to two people competing for the title. The others comics could place no higher than third place. Broussard and Goldsmith were the two comics fighting for first place. When the final results were in, Matthew Broussard won it all and became the 2012 winner of Houston’s Funniest Person contest! A great ending to a great contest. A few thoughts… When everyone found out that Sherlock’s had closed its doors, John Wessling and Rob Mungle worked vigorously to secure a new venue for the contest. I knew that had to be a stressful day for them. Their hard work did not go unnoticed. They went out and found multiple guest judges for each night. Another thing I was impressed with was the amount of information given to everyone and the timely manner in which it was given. The order the comics would perform in and the results from each night were updated on the HCU website. Go to http://houstoncomedyunion.wordpress.com/ for the complete details of the entire contest. There were also some opportunities in my mind. The contest took place on 5 different stages. Baker St Pub and Fitzgeralds were not originally part of the plan, and I understand that. Nobody was at fault for that. Did that give an advantage to one comic over another? Maybe, maybe not. The funny will advance no matter what stage they perform on. The only other thing I wanted to mention was the finals. They took place over the course of three nights. On the last night, only two comics were in the hunt for the title. It eliminates everyone else on the final night. It was a numbers game at that point. Perhaps a one or two night finale, I’m not quite sure. Having said that, the entire contest was a huge success. I was very impressed with the attendance throughout the contest. Comedy lives in Houston. Support Local Comedy! This entry was posted in Comedy Scene in Houston and tagged david gavri, funniest person in houston, houston's funniest person, houstons funniest person contest, kevin farren, matthew broussard, steven padilla. Bookmark the permalink. i was glad to be in this years Houston Funniest’s Person contest. i will try to be in it next year.